I REALIZED that, for some reason, Paul Frank has always had cupcake–themed merchandise every season. The first time I saw their “Will Work For Cupcakes” T-shirt, I knew exactly who to get it for. Amidst the frantic festive feeling that defined my few days in the Philippines, I resolved to squeeze a few hours’ worth of trip back on that strip called Bonifacio High Street. And of course, to pay my favorite cupcakes place a visit. I did intend to sink my teeth into one of my all-time favorites, the Red Velvet Vixen, but more importantly, I went there to drop off my present for my favorite pastry chef, hailed by a top magazine as the Creative Cupcake Queen, Sonja Ocampo. She was out on her own vacation at the time of my visit. But the moment she got hold of her Paul Frank loot, she sent me a text message that was just as sweet as her own confections. See you soon, Sonja! I left a note with my present. 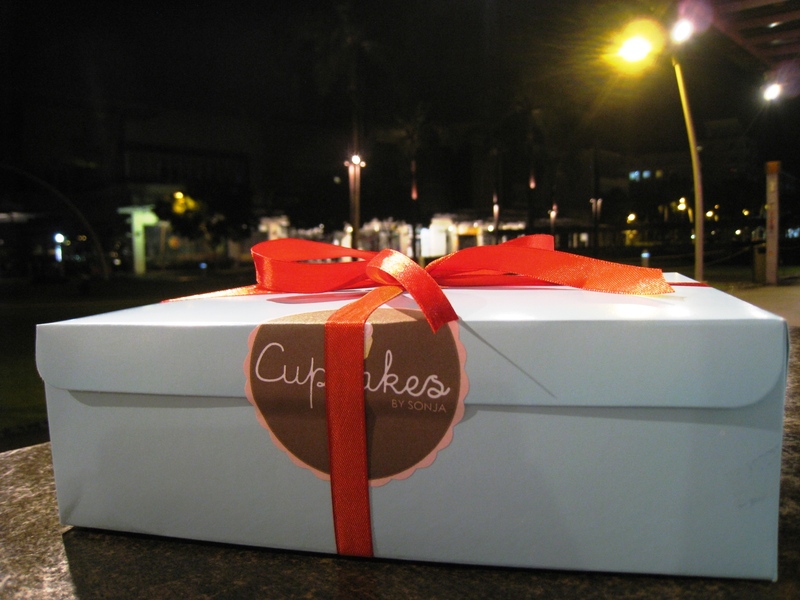 One of the send-off presents I received before moving to Singapore was a box of my favorite cupcakes from Cupcakes by Sonja. Peanut Butter Nutella cupcake, which Sonja made especially for the Virlanie Foundation, and my favorite, the Red Velvet Vixen. A tight shot of arguably one of the prettiest cupcakes I have ever seen and had. Clearly, no scrimping on the frosting here! 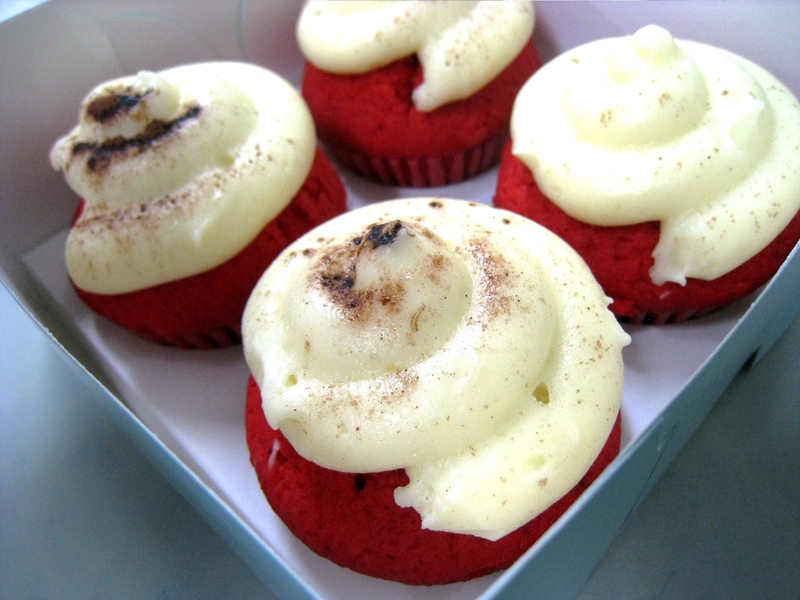 The cream cheese frosting alone on the Red Velvet Vixen can send shivers down my spine. This is that good. Peanut Butter Nutella. Eat Pay Love. CUPCAKES BY Sonja keeps giving back. And I keep coming back! It’s like having your very own Eat Pay Love moment. Have your cupcake and eat it too. Pay for it. And, send ripples of your love to as far as they could go. I’m sure that’s what happens when part of the proceeds go to a good cause. A box of four. Actually, one of boxes of four. That exactly is the case with every purchase of the Peanut Butter Nutella cupcake by Cupcakes by Sonja. Reminiscent of her “Red Velvet Vixen for Red Cross” campaign in 2009, this new socially responsible drive benefits the Virlanie Foundation – “Giving back the smile to street children”. And sinking your teeth into one of these peanut butter-nutella confections likewise couldn’t help but put a smile on your face! I love peanut butter, reason enough for me to explore turning it into a sauce for egg noodles long before I got formally exposed to the wonders of Indonesian satay. But over the years, I’ve come across peanut butter cookies and cakes that had proven to be wanting. Even Otis Spunkmeyer’s version of the classic peanut butter chocolate chip cookie wasn’t able to impress me. 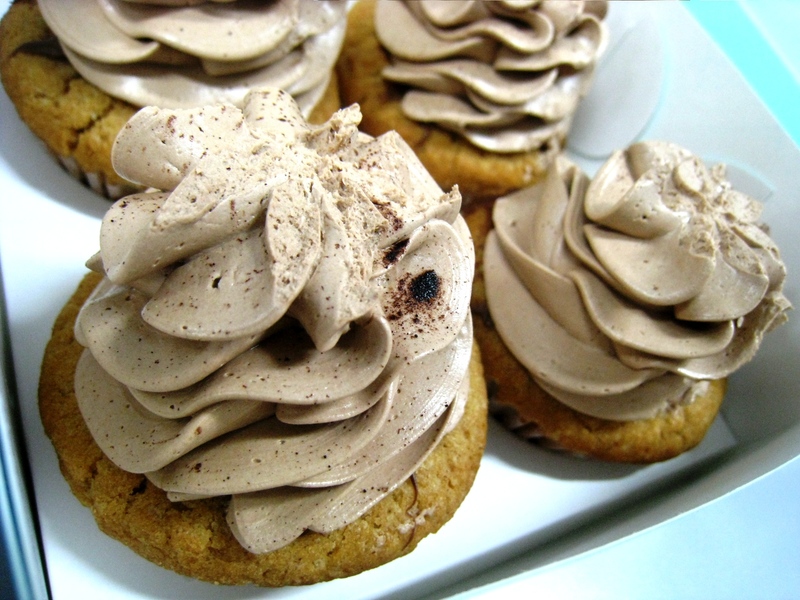 I just love the height and the look of that Nutella buttercream frosting. Cupcakes by Sonja’s Peanut Butter Nutella cupcake puts an end to the dry spell that’s my search for a really satiating peanut butter confection. It has got to be one of the most visually compelling in Sonja’s wide array of offerings – an imposing tower of swirls of nutella-spiked buttercream frosting sits prettily on top of the peanut butter cake, in which is ensconced a dollop of Nutella chocolate hazelnut spread. It’s an “architecturally sound” work of edible art as handling and traveling didn’t compromise the integrity of the frosting’s design and structure. I freed one from the hold of the box-of-four liner and soon the feast for the eyes became a feast for the palate. The cake is crumbly and moist, my Oneida Silversmiths dessert fork being chased by just enough eager and yummy crumbs as it pierced its way through to the bottom. The flavor is undeniably peanut buttery – unapologetic in its goodness but at the same time, not cloyingly sweet. And when savored in the mouth, it is amazing how a small piece of cake – kissed by Nutella, and slathered with buttercream – becomes something big. And when you get reminded where part of what you paid for for the cupcake goes, you do realize just how big. Now, doesn’t that bring enjoying dessert to a totally new level of guilt-free? A pile of treats from Cupcakes by Sonja! My all-time favorite is somewhere in there. Four red velvet vixens in a box! 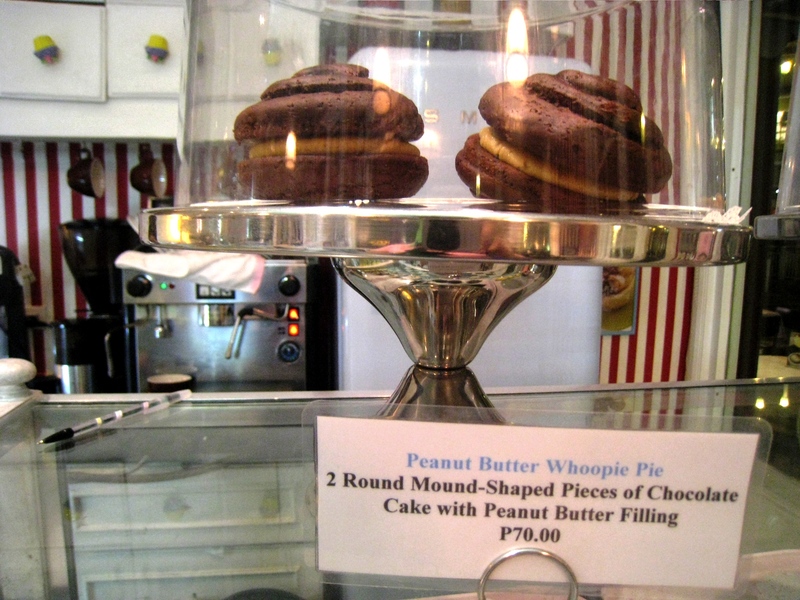 I just had to get these too – Peanut Butter Whoopie Pies! 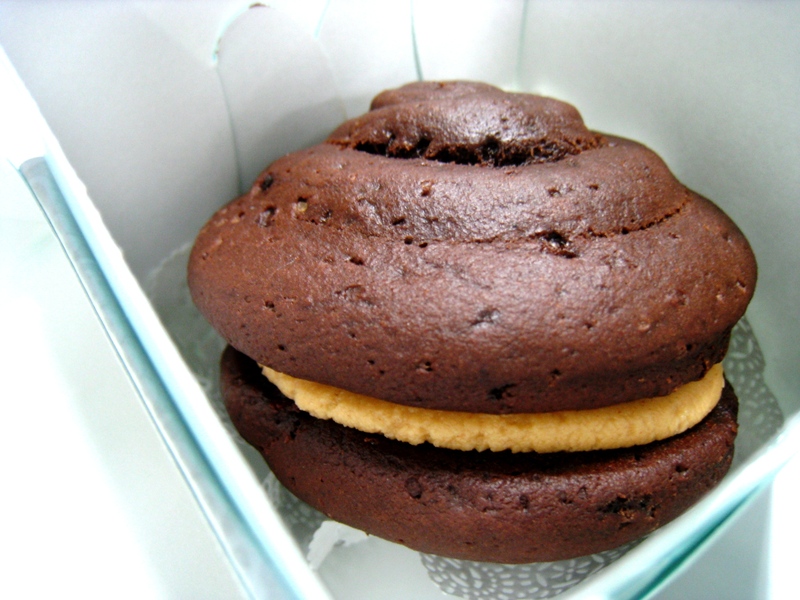 The very scrumptious Peanut Butter Whoopie Pie in a solo box. The "doily" that lined the pie against the box was a nice, elegant touch. Sharing the love – a Peanut Butter Nutella and a Red Velvet Vixen shared with our company's very efficient and outstanding Executive Admin Assistant, Ms. Deng. My excitement over the Peanut Butter Nutella cupcake makes it to a card. 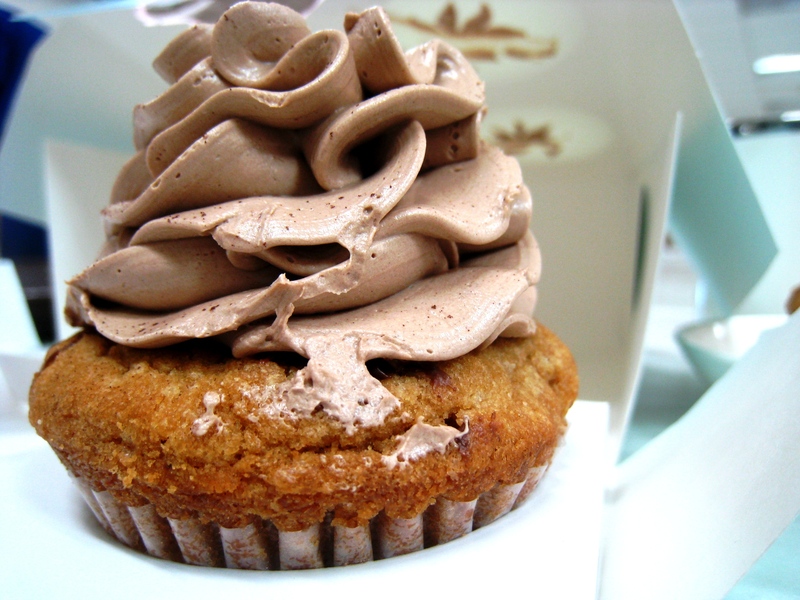 Every purchase of the Peanut Butter Nutella cupcakes benefits a good cause. CUPCAKES BY Sonja is giving back! Have your cupcake. Eat it. And help too! For a limited period, CUPCAKES BY SONJA, through their customers, is donating Php 5.00 to the Philippine National Red Cross (Rizal Chapter) for every purchase of their signature Red Velvet Vixen cupcake. Now, doesn’t that sound like the perfect deal?! On my visit to their store last night, this was the first thing that captured my attention. Strategically positioned on top of the display counter and right on the dividing glass to the kitchen are the posters that announce this worthy cause. I was told it just started this week. So apart from this cupcake being one of my all-time favorites (already), this signage made my choice for last night’s cupcake all the easier! Make that choice for last night’s cupcakes. I don’t know what it was, but I managed to down a couple of these moist, flavorful, cream cheese-frosted confections! And for the first time, I tried their brewed coffee (extra cream and sugar, please!). Funny that it has been a couple of years already since I first started frequenting this store and it was only last night that I finally noticed they have their own coffee machine! See, even with those you’ve been so used to, there’s always something new to discover or learn in an otherwise usual day. 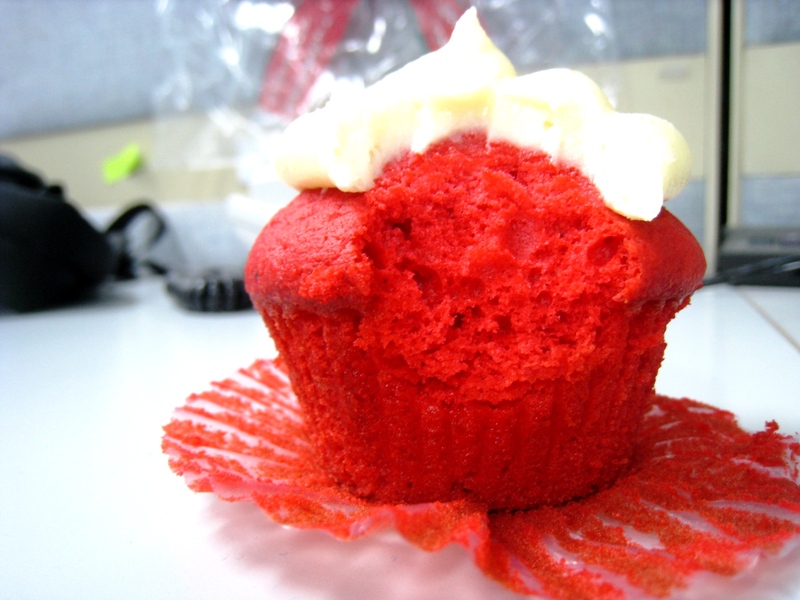 The first Red Velvet Vixen Cupcake I devoured in the store premises. And that's the brewed coffee you see. That's the second red velvet I devoured!... Just couldn't get enough! Yes, I again had that comforted and satisfied feeling in my tummy. But knowing I somehow helped out a worthy cause (no matter how little), makes the feeling more profound. As it turns out, this tie-up between Ms. Ocampo’s signature Red Velvet Vixen cupcake and the RED CROSS has been in the works for a while. It is just so nice to see it into fruition. And as I have said in my “recessionista” post a short while back, if there is anything that these trying times have room for – it is generosity. Next on my must-try list - the NUTTER BUTTER COOKIE! ** And of course, I got a few boxes for special people. I had a box of four Choco Cream Cheese Swirl cupcakes put together for four new friends. Another two boxes of four Red Velvet Vixen cupcakes (I finished a couple more at home!). And I had two sets of boxes of four – two Bunny Huggers Carrot Cake cupcakes and two Red Velvet Vixen cupcakes – one each for Spider-man and Superman. Ms. Ocampo graciously threw in for free an “Elvis,” though I would insist on paying (I never mind paying for good food or service). The Reese’s peanut butter chocolate pieces on top of the whipped cream were portents of the yummy-ness underneath – cookie crust, peanut butter mousse… caramelized bananas! Now that’s a specialty cupcake!… The “Nutter Butter Cookie” sandwich is next on my list of must-try goodies! NO, I am not about to burst into song as I write this one. What the heck!… All together now: “Sweets for my sweet / Sugar for my honey / …” Hahaha! 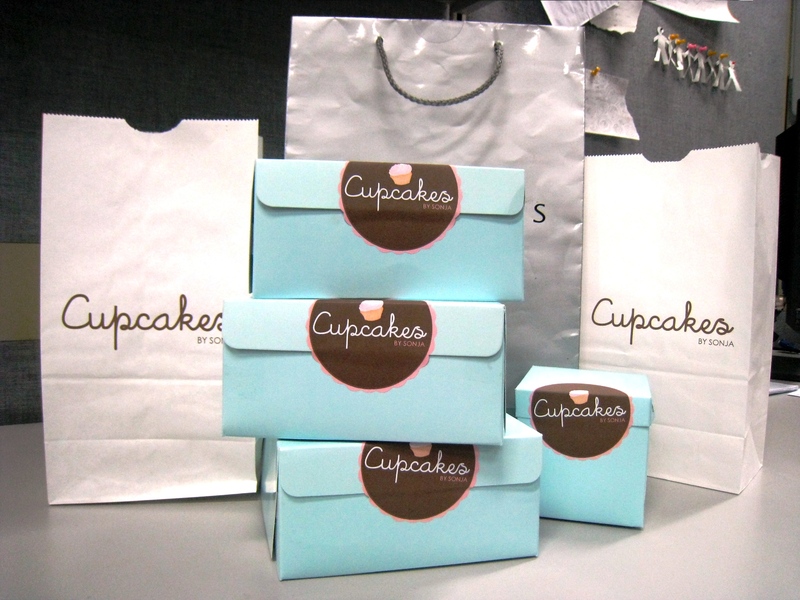 For a while, my team in the office has been making “lambing,” asking me to bring them cupcakes. They’re all swamped with a lot of work way beyond “punch-out” time – mostly stuff I actually need (ask) them to do! – but from time to time, they do read my blog. Aside from the surprise they would get in seeing another side of me – the realization that I am not so much a “monster” – one thing that has happened for sure is that they have absolutely fallen in love with CUPCAKES BY SONJA. Now that’s a FALL I’m so glad they have taken. The very lovely Len with Spider-man's box of four Bunny Huggers Carrot Cake cupcakes! So in the very good mood that my THAI AT SILK dinner with Batman had put me into, I went to Cupcakes By Sonja to pick up boxes for my engineers. There’s only so much that a couple of hands can handle, so I could only get one for each. Though everybody knows that Spider-man (one of my best friends) would always get his own box. He is after all, in a league all his own. Hehehe. Spider-man's box of four Bunny Huggers Carrot Cake cupcakes! Of course, I definitely do not see any throwing-under-the-bus happening within my team ever, but that snippet is just a glimpse of the hardwork and the sacrifice that the people who work “for” and with us have to do or endure sometimes. So a cupcake is but a small gesture. That's Albert, K-Anne and Roy Patrick! All in a row - Edu, Adam, K-Anne, Paulo, and Roy Patrick! All smiles with their red velvet vixen cupcakes! This is where the best cupcakes come from! (Find the store in the picture. Hehehe..). A lovely cupcake tower! I just learned from Sonja that she makes this to order. FOR THE first time last night, I noticed that the seasons – at least as we know them here in the Philippines – are already changing. Superman himself agreed with me and somewhat expressed dread over the thought of the coming scorching summer heat. Which in my books is rivaled only by the summers I’ve experienced in Shanghai and Folsom. The functional work of art below – a fountain (sorry I don’t know who made this one) – is the first thing I look for, and stare at, everytime I get to Bonifacio High Street on early Monday evenings. My travel time from work has been constant and everytime, I have been staring at this beautiful fountain (or water something) in the darkness for the longest time, so to speak. So when I felt the rays of the sun still breaking free of the clouds and not really hiding behind them, as I struggled to get a good shot with my Nokia 5310 XpressMusic cellphone, I knew the seasons are indeed about to change. Two of my favorite stores - Healthy Options (for mama's favorite chocolates and cookies) and Alessi (for wristwatches!). Hopefully the same could be said about this other “season” – the recession period. A number of posts back, I have harped about being a “recessionista” and how that kind of mindset may very well help someone survive these trying times. But every time I’m in Bonifacio High Street I couldn’t help but wonder, “Is there really a crisis?” And it doesn’t help to know that in the midst of all the crumbling financial institutions towards the end of 2008, Burberry managed to post a double-digit increase in their sales in the latest financial half year. So I guess some things are recession-proof after all. 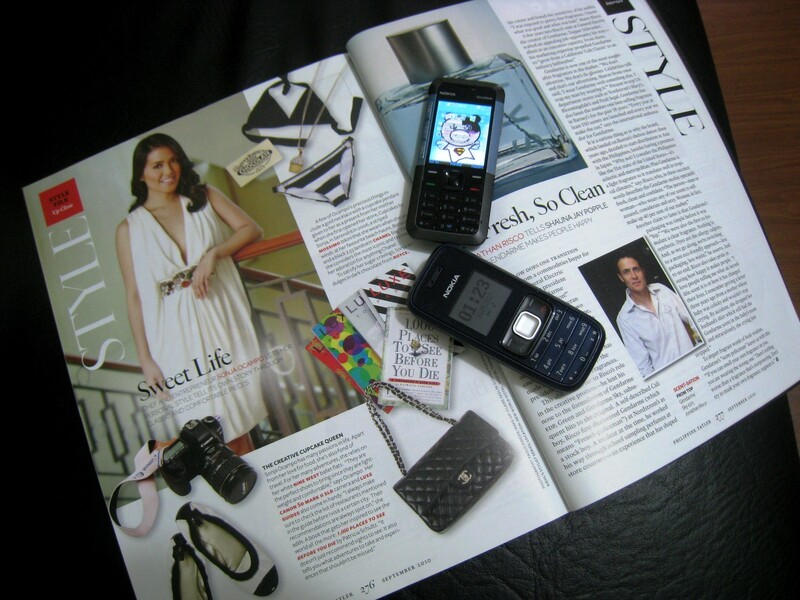 I think luxury – the CONCEPT of luxury – is recession-proof. But I’m saving all the luxury talk for some other post. So there I was, walking my way towards the Serendra Piazza to get my Monday night fix, my own personal luxury. Sonja, bright and bubbly in a yellow top, was again in the store. Before I asked for my Choco Cream Cheese Swirl cupcake with cream cheese frosting and the big Chocolate Madness Milkshake, I just had to ask her if she accepts orders for cakes (the big ones). I haven’t decided on the variant / flavor yet. But I told her the concept I had in mind. I’m really excited about this cake (should I end up ordering it). But while I ran this thought in my head, I sat on the stool by the bar facing the pedestrian traffic outside. I watched the light disappear into the darkness. And I felt nothing but contentment – the security of keeping that part of my routine – that I could still manage to do the little things that help take care of myself. And of course I had to get boxes to go! I had one each for Superman, Spider-man… and the Rizzie! I made sure their personal favorites were thrown in. Superman's Box - Banana Monkey Pie (a new one for him to try! ), Melt-In-Your-Mouth Valrhona Flourless Chocolate Cake, Bunny Huggers Carrot Cake, Red Velvet Vixen. Spider-man's Box - Just what he specifically requested... 4 Bunny Huggers Carrot Cake Cupcakes! He finishes the frosting first before he goes to the cake. Hehehe. I, too, LOVE Sonja's cream cheese frosting! Photo taken by Spider-man using his own iPhone. Rizzie's Box - Lemon Drop, Berry Delight Strawberry Cheesecake, Berries N' Cream, Bunny Huggers Carrot Cake. That's my good good friend Rizzie with her box of 4 cupcakes! Lost in a swirl… and eNTeNG loved it! 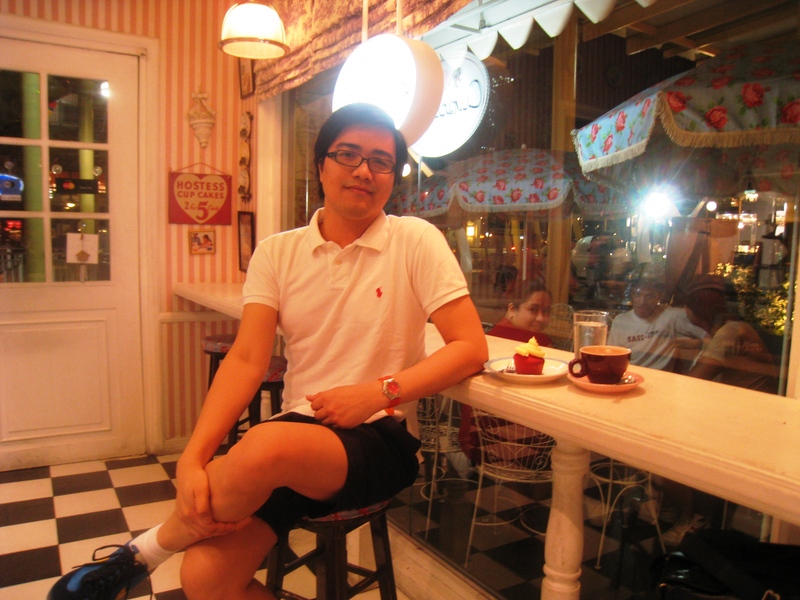 As I promised myself last Sunday night, I went back to Cupcakes By Sonja on Monday evening – not only for my regular fix – but also to try one of their new offerings. 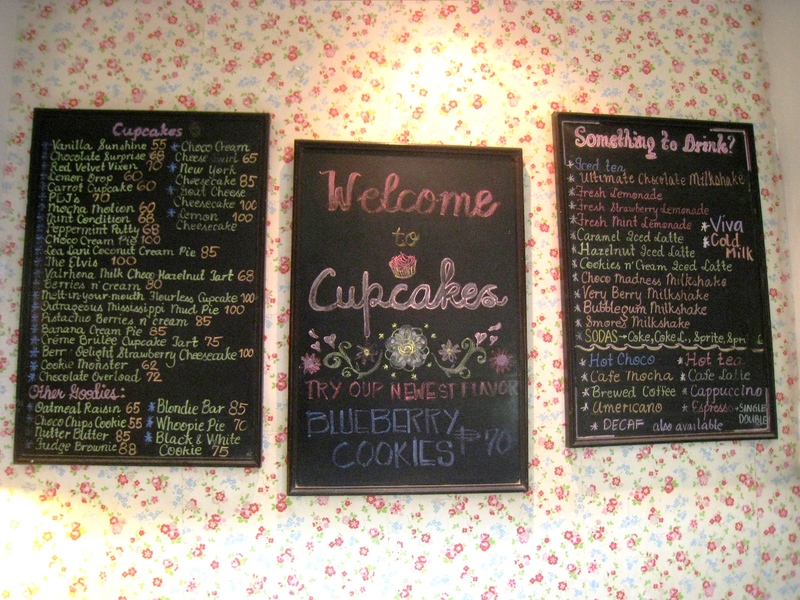 I trained my eyes on the lovingly handwritten cupcakes menu on the wall, and as my sights reached the end of the list, I felt as if a jolt hit my synapses, shaking me out my dreamy expectations for the feel of perfectly melding chocolate and cream cheese partying in my mouth. Sonja, carefully puckering her lips, motioned to her staff to check the other end of their display. And then I saw it! The sight of nine cupcakes in the variant I was so lusting after, instantly put me out of my temporal misery. I asked for one and, for yet another change in my routine, I requested for their Chocolate Madness Milkshake! Clearly, I was ready for a chocolate overload! The perfect accompaniment - the Chocolate Madness Milkshake! Before I dug my dessert fork into the cupcake, I told Sonja that I was really excited to see how this cupcake looked (and tasted) like, especially since one of my most favorite desserts is the Godiva Chocolate Cheesecake from The Cheesecake Factory, at their store on the top floor of Macy’s Department Store in San Francisco. With the Sonja’s creation right in front of me, I noticed the most striking difference that also quickly reminded me how stupid I could be sometimes! Sonja’s is a cupcake, not a cheesecake! But don’t get me wrong, I never felt even an iota of disappointment. As a matter of fact, holding the cupcake in my hand, what I felt all the more was how my appetite had been whetted. 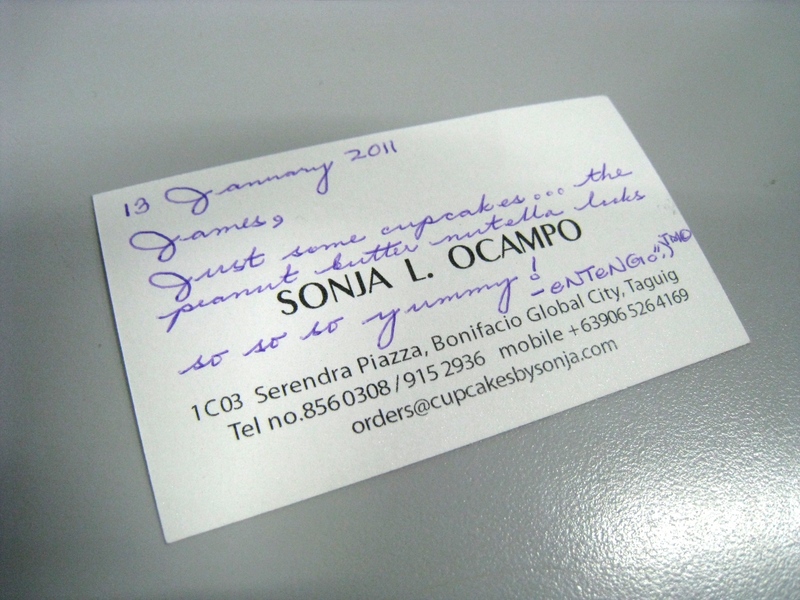 Only the highest quality ingredients will do for a Sonja Ocampo cupcake! Don't you just want to devour this confection?! Cupcakes By Sonja’s Choco Cream Cheese Swirl tempts with a crackly, marbled top that’s a throwback to the chocolate marble ice cream of my youth. And this is not food color I’m talking about. What it is is actual cream cheese, chunks of which were dotted on the cake and as these melt with the heat, they are swirled to create that perfect mabled effect. Like puffy clouds I could just touch at more than 30,000 feet up in the sky, the cream cheese swirls work their way all over the top, bound clearly with the deep dark brown chocolate cake, at the same time bound with blurs of what appear to me as froths from a hot cup of cappuccino. I worked my fork all the way thru the cupcake and I instantly got how it somewhat resembled a brownie – the perfect brownie. But what I wasn’t prepared for was how my palate was arrested by the distinct and married textures and flavors from this swirl cupcake. The cake itself has a packed, perfect crumb, boasting of melted cream cheese that made it (the cupcake) ooze with more creamy goodness. I kept chewing and realized that the cream cheese not only accentuated just how good the chocolate cake is, but how perfectly it is kept moist. Another quick piercing with my fork revealed another layer of surprise from this cupcake – it has a gooey center, generous with molten chocolate! It is just so good. Kim told me that I could request for cream cheese frosting on top. And had I asked for it, that would’ve made my cupcake cross over to decadent – still, in a good way! While I selfishly confine myself to my world of me, my cupcake and I, I didn’t forget to have some boxes put together for special people. As usual, I made two identical 4-cupcake boxes – one each for Spider-man and Superman. Each has a Melt-In-Your-Mouth Flourless Chocolate Cupcake, and three Choco Cream Cheese Swirl cupcakes – two with cream cheese frosting, and one without. I asked for two sets of this box of 4 special cupcakes - one box goes to Spider-man, and another to Superman! It contains 3 choco cream cheese swirl (2 with cream cheese frosting) and 1 melt-in-your-mouth valrhona flourless chocolate cake. Superman likes chocolates a lot! I could imagine serving this cupcake after a fabulous dinner. And for sure, the moment it comes out of the kitchen, a hush would fall in the room, as its presence is acknowledged. And with bated breath, each would grab his own cupcake, admire it for a short moment, and with the very first bite get transported all the way to dessert heaven… or la-la-la land. With Sonja’s Choco Cream Cheese cupcake in my hand, I don’t need The Godiva Cheesecake at all (not just yet!). I even totally forgot Giada’s chocolate cake! 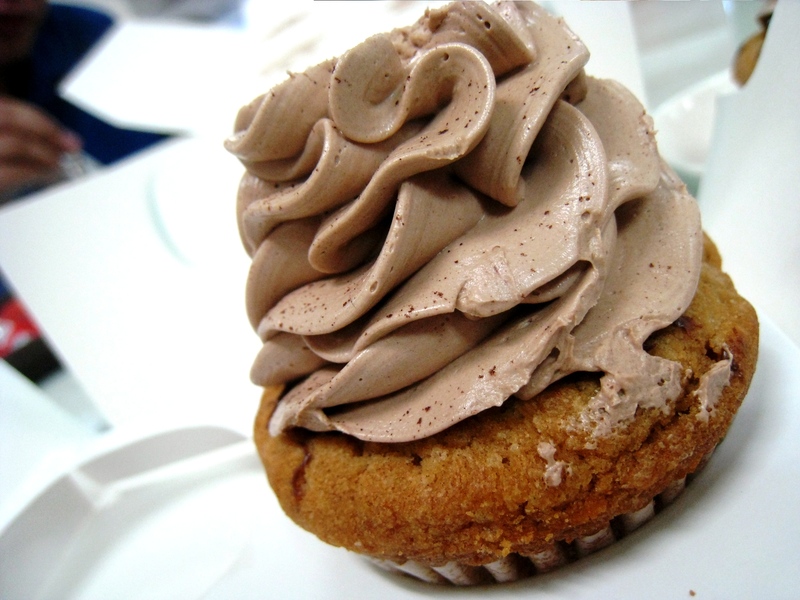 Cupcakes By Sonja started offering the Chocolate Cream Cheese Swirl this January 2009. I think it is still a limited edition cupcake. Their store is at 1 C03 Serendra Piazza, Bonifacio Global City in Taguig. Tel. No. 856-0308. e-Mail cupcakesbysonja@gmail.com. New offerings from Cupcakes By Sonja! With a Red Velvet Vixen Cupcake and Caramel Hot Chocolate... all's fine in the world. I woke up on Sunday morning with a hankering for cupcakes that just wouldn’t let up. So off I went to Cupcakes By Sonja! Going back to the handwritten menu board, I noticed that there were a number of “new” items! I particularly took note of the “Chocolate Cream Cheese Swirl.” I couldn’t help but wonder how this would be, knowing for a fact that one of my most memorable chocolate cream cheese cake experiences was the “Godiva Chocolate Cheesecake” from The Cheesecake Factory in San Francisco. My friends and I would take the whole 215.88-miles round trip just so I could get that cheesecake! Other new items are the Key Lime, Chocolate Tofu, Smores, Choco Chip Cookies, Caramel Pecan Brownie, Coco Blondie, Salted Valrhona Choco Bites, Nutter Butter, and Lemon Tea Cake. They all sound so yummy!!! With a smile, served by the staff – the Red Velvet Vixen Cupcake! Caramel Hot Chocolate. Tsokolate Eh! But as usual, I asked for my favorite of the moment – the Red Velvet Vixen Cupcake – though this time, I asked for a hot drink to go with – the “Caramel” Hot Chocolate. 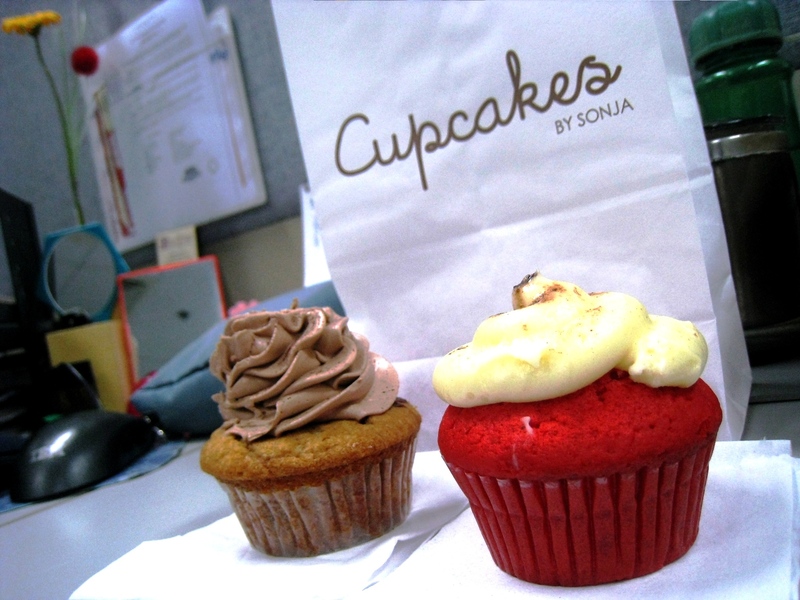 You already know how much and how deeply I feel for this confection that is Sonja’s red velvet cupcake. What I was kind of excited to try was the hot chocolate (which I later realized to be spiked with “caramel”). It was good. Really comforting even! Very much like how a warm blanket would feel on a very chilly night. It was a bit thick, enough to bring back thoughts of just how sinful and how rich and superior in quality the “Tsokolate Eh!” of our ancestors must have been. Without question, I went through my cupcake in a breeze. But of course, as I devoured this “piece of cake,” Sonja was kind enough to keep me company, so to speak (remember, she is always so busy!). She asked me about the next places I’m planning to visit. I rattled off a few names – of course, Thai at Silk was at the top. I want to go back there and, as I had told her, take good pictures of the dishes. Then, there’s Azuthai. And then, I mentioned to her that I have wanted to go back to one of my years-long favorites, a restaurant I first discovered in the Magallanes commercial complex, where it was right next door to an art gallery. Lately, I’ve been to both its branches in the Greenbelt 2 restaurant strip and at Corte de las Palmas in Alabang Town Center. Seeing that I am a years-long fan of their restaurant, I went on declaring my all-time favorites with unbridled enthusiasm. I have a “holy trinity” of sorts (she already knows which ones!). 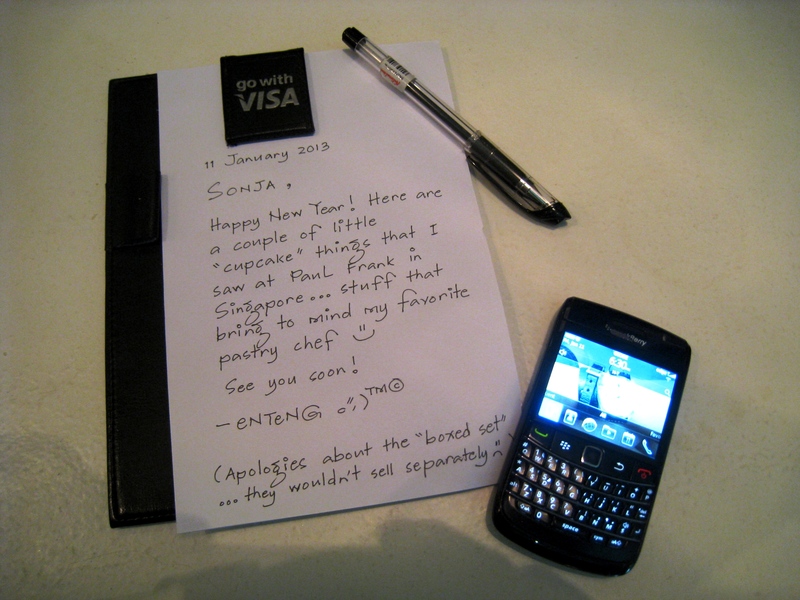 But during the course of our conversation, what I took away was Sonja’s palpable pride on her chef and her staff. As another very successful restauranteur – Margarita Araneta Fores – once shared on an interview somewhere, one’s staff is key to a restaurant’s success. And just like Ms. Fores’, some of Sonja’s staff from her other ventures have stayed with her, and one of them, Lucky, now works at Cupcakes. Which brings me to a fitting close to this post. A huge shoutout to the wonderful staff of Cupcakes By Sonja’s who always ensures that a visit to their store is such a pleasurable experience – Kim, Debbie, Lucky and Len! Hi to the bakers too!